When looking across the body of UFO evidence one subject has more often than not been associated and reported with the phenomenon: flying Black Triangles that have been seen everywhere. What mysterious purpose do these craft exist for, where do they come from, and who is at the controls? 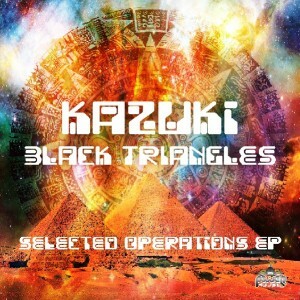 Kazuki tells us the story of his galactic flight through the realms of progressive and psychedelic sounds with this four track sampler selected from the eleven track full album Black Triangles released in 2014 by Power House Records. Mastered by Geomagnetic Records with artwork by Effie Dee. MP3 Download | FLAC Download | WAV Download · Download count: 4,229. Sounds and rhythms truly beautiful and engaging! Yep I see it the same! Love it………….more more more….why isn’t more prog like this? Groovy, relaxing, feel good vibes. THX!